Join Sioux City GO on Thursday, February 21, 2019 at 5:00 PM for Innovation Market! This year's Innovation Market will be located in the atrium of the Ho-Chunk Centre. What is the Innovation Market? Great Ideas…We’ve all had them, but many ideas never leave the idea phase. The Innovation Market strives to bridge that gap from inception to reality! 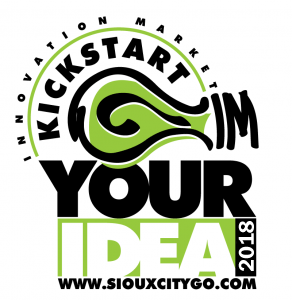 Put on by Sioux City Growth Organization (SCGO), the Innovation Market is Sioux City's one and only business idea competition. Individuals submit their ideas online to take part in one of the biggest think tanks in the area. First, this event will cultivate positive action in the community by connecting positive people as well as introducing like-minded leaders who are excited about growth and change for Sioux City. Secondly, this project grew out of a “Fill Empty Spaces” idea. SCGO saw a need to showcase vacant spaces and that is exactly what the Innovation Market accomplishes. Finally, it’s about ideas. Taking ideas, however big or small and growing those ideas into action. We offer a $5,000 cash prize to the winner of our Innovation Market as seed money to help grow their business idea into a reality! Follow our Innovation Market Facebook page for continued updates about the event and additional entrepreneurial features!